Today the heavens opened up and the wind blew. Starting at about Noon, an umbrella or a slicker was a necessity. It was cold and damp and not very summery at all. Honestly, it was the perfect evening for soup- but there wasn’t time. By the time the weather did its’ thing, it was already Noon and I had a big day of stuff to do still in front of me. Yet, for dinner I craved a soupy type fix-just one that was fast! I have been yearning for Japanese Noodles recently. The thought of warm chicken broth loaded with mushrooms, cabbage, noodles and tender pieces of chicken has floated though my brain of late. Who knows where this craving came from…but, today, as the weather turned south, I was sure that this was the day to resolve it. I started with a search through my recipe file. Right away I found a recipe that almost hit the mark. It was a recipe for braised halibut with clams. It looked like a cozy almost soup-but not quite- meal. I must admit that while the recipe looked good, I knew that for my taste buds, it needed tweaking. Still, it was fast and had many of the same traits as the Japanese soup of my cravings- just no noodles, chicken or cabbage, but who’s counting? What it did have was yummy fish and a delicious sounding broth. Also, it took twenty minutes to make. Deal struck-I could live with that. I made the dish- tweaking it substantially to give it more zip and because there were no appropriate clams at our local fishmonger. Instead, I substituted shrimp. Then, Tad and I dug in. It was everything I had hoped for and more. It was warm and cozy yet lighter than air. You could absolutely add the noodles to it- but I did not miss them in the least. I think that I have found the perfect summer cold day meal! It would be wonderful with clams, but the shrimp were fabulous too. In short, this dish is a homerun! 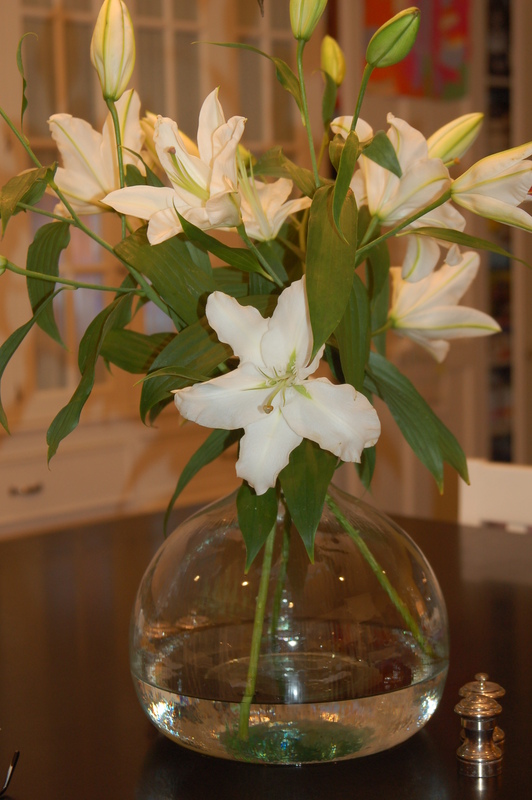 ps: Kudos to Joanne and Ingrid for the absolutely beautiful vase that now graces my kitchen table. Well done girlfriends! Melt the butter over medium heat in a large straight-sided sauté pan with a lid. Add the mushrooms, jalapeno and leeks and season lightly with salt and pepper. Cook gently, stirring occasionally, until softened but not browned, 7 to 8 minutes. Add the stock, raise the heat to medium high, and bring to a boil. Season the halibut with salt and pepper, nestle the fish and shrimp among the vegetables in the skillet. Bring the broth to a boil, cover tightly, and reduce the heat to low. Cook gently until the fish is just cooked through- about 7 minutes. 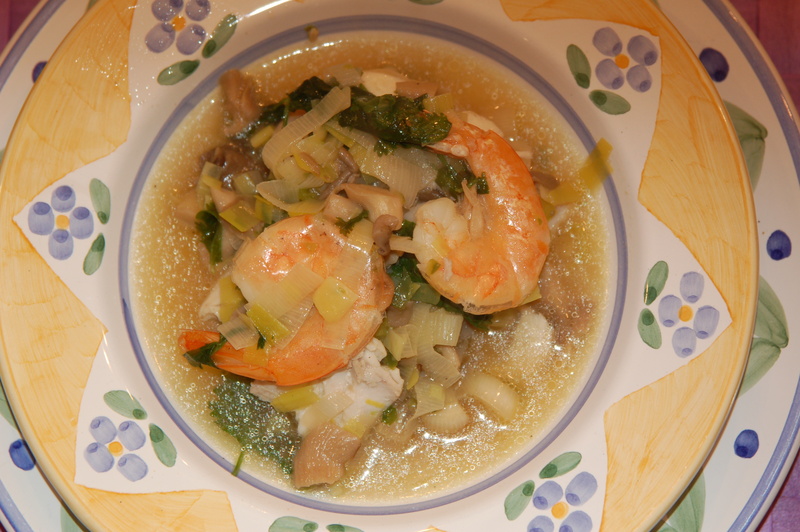 Serve the fish in a warmed shallow soup bowl topped with the vegetables, shrimp and broth. Sprinkle with chopped cilantro. 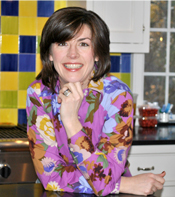 This entry was written by Caroline, posted on June 9, 2010 at 8:58 pm, filed under Fish, light, seafood. Bookmark the permalink. Follow any comments here with the RSS feed for this post. Post a comment or leave a trackback: Trackback URL. I know it is summer vacation (almost anyway) but I miss the dailyness of you. The banana bread continues to be a staple and is used in sooo many applications. Teenagers, grade schoolers, adults, I have no one who doesn’t subscribe. And all the recipes are so well loved. I am keeping an eye…Keep it coming. This soup sounds lovely. OOohh how I love a good soup! Gorgeous vase sweetie!